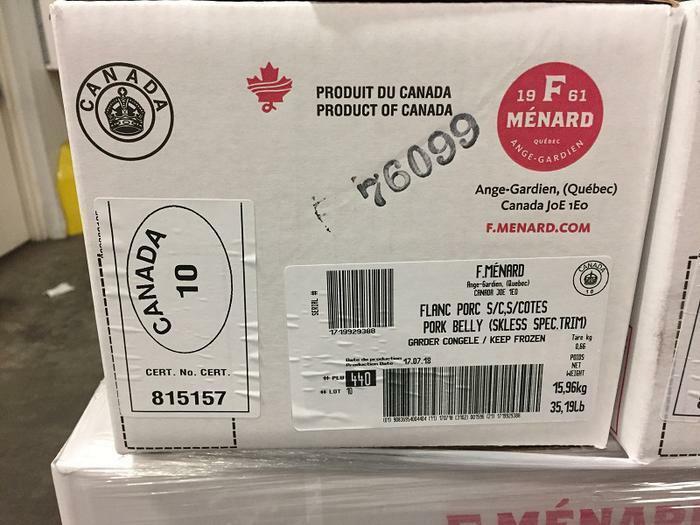 Ronald A. Chisholm, Ltd., of Toronto, Ontario, Canada, is recalling approximately 12,169 pounds of skinless pork bellies. The products were not presented at the U.S. point of entry for inspection. Without the benefit of full inspection, a possibility of adverse health consequences exists. The recalled products, bearing case code “815157” and establishment number “10” inside the Canadian Food Inspection Agency (CFIA) mark of inspection, were shipped to restaurants in Hawaii. Consumers with questions about the recall may contact Steve Needham at (818) 770-3903.